Trading Thomas: Will the Bruins Deal the Veteran ‘Tender? Despite copious accolades and over a decade spent with the Boston Bruins organization, Tim Thomas may be headed for the trading block. 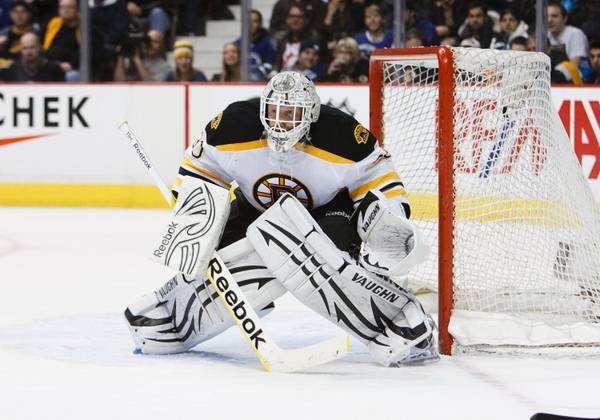 The 38 year-old goaltender’s name has frequently come up in trade rumors and speculation in the offseason following the Boston Bruins’ first-round exit from the 2012 postseason. Can one ever successfully trade a legend? It’s a question professional sports franchises have asked time and time again. While Thomas’ attainment of that stature is undoubtedly debatable, his folk hero status was cemented with an unbelievable Cup Final performance last season. Whether it’s simply a matter of getting a fair and equitable return or the much more difficult task of selling such a deal to their fanbase, trades involving players of the highest magnitude come with more than their share of complications. Resultantly, we may be inclined to take GM Peter Chiarelli’s words at face value. Earlier this spring, Chiarelli declared that he was “not inclined” to deal the B’s star netminder. Who can blame him? The tandem of Thomas and Tuukka Rask have proved outstanding over the past three seasons as the Bruins have consistently been one of the most stingy defenses in the game. 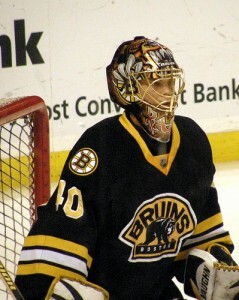 Thomas has won two Vezina Trophies in a Black and Gold uniform and a Conn Smythe trophy backstopping the Bruins’ 2011 Cup Championship. Still, with Tuukka Rask’s development into a top-flight starter, the B’s are faced with a conundrum: Potentially stunt the development of their future No. 1 ‘tender by continuing to minimize his experience each season, carry two number-one’s and split game-assignments down the middle (despite the salary-cap woes that might create), or deal Thomas – one of the best goaltenders in the game – for potentially less than an ideal return. However ‘inclined’ Chiarelli and B’s brass feel on this issue, they certainly will explore every option. There are certainly some who believe that moving Thomas inevitable during this offseason. These individuals reason that with the Battlefly’s no-trade-clause coming off the books in July, the Bruins will attempt to secure a decent return rather than seeing him walk as an unrestricted free agent a year later. The writing may be on the wall for Thomas’ exit. In addition to an expiring no-trade-clause with a single season remaining on his deal, Thomas is only slated to earn $3 million in actual salary in 2012-13 – an attractive figure for bargain-basement teams. Furthermore, the Bruins have a solid replacement in Anton Khudobin on a one-way deal waiting in the wings (and the B’s have reportedly signed Niklas Svedberg, a 22 year-old stud from Brynäs of the Elitserien). Even with those facts, there’s little impetus for the Bruins to move the veteran puckstopper for anything less than market-value. If they chose to keep him, their cap situation for next season is hardly tenuous and they could let him walk in ’13. It’s far better for them to retain him – arguably the best goaltender of the past half-decade – than to let him go for peanuts. With only some modest incentives to deal Thomas, other organizations will kick the tires on other deals rather than pay anything close to a premium for the veteran ‘tender. Chicago Blackhawks: The Hawks have one of the more talented rosters in the game – outside of the net. Adding Tim Thomas would immediately vault them to the top of the contenders for the Cup in ’13, and the Bruins would be glad not to have to send him to one of their Eastern Conference rivals. The bad news? The Hawks are one of the more cap-strapped teams (pending the new CBA) and would likely have to send some salary back (or out in another deal) to manage Thomas’ hefty cap-hit. Tampa Bay Lightning: The Bolts were one win away from the Cup Finals in 2011 and despite their disappointing finish out of postseason contention this past season they have outstanding talent up-front. No team allowed more goals per game than Tampa last season – and putting Thomas between the pipes would undoubtedly help the situation immensely. Unfortunately sending Thomas to a conference-rival is a dangerous proposition. San Jose Sharks: Yes, San Jose has Antii Niemi, but you’d be hard-pressed to find an analyst who thinks he’s superior to Thomas. The Sharks certainly have other problems but the clock is ticking on their window of contention and GM Doug Wilson might feel the pressure to take a risk. Their cap situation is rough, however, and unless some salary moves out the door, adding Timmy might be a nonstarter. Columbus Blue Jackets: Ok, so they don’t exactly fit the “contender” qualification, but if Scott Howson manages to hold off the pink slip for another offseason, he’ll be aiming for a postseason spot to (potentially) get him some job security. Thomas would be a gigantic upgrade over Steve Mason and Co., and with a little luck (and more offseason movement) they could challenge for a berth. However, the Jackets are probably more interested in a long-term solution and outside of Rick Nash (who’s probably too rich for the B’s blood on several levels…) they don’t have ideal pieces to secure Timmy T’s services. The Field (Detroit, Florida, NY Islanders, Toronto, etc. ): Detroit could look to add the Flint-native, Thomas if Lidstrom decides to push for another ‘final’ season. The Islanders could certainly use some world-class goaltending, but they’re more than an elite netminder away from contention. Toronto makes a good deal of sense as a destination, except for their unfortunate position within the Bruins division – and the B’s wouldn’t enjoy the possibility of facing Thomas six times during the regular season. Thomas’ potential availability will feasibly fetch attention from other franchises as well. However, unless teams are willing to pay what he’s worth (and more if they’re in the East), Thomas will be wearing a Black and Gold sweater come October. Value is notoriously hard to pin-down, particularly in the case of goaltenders. Deals for signed, veteran number-one starters are particularly rare. There are few comparable deals (considering age, talent, contract status). Dwayne Roloson’s move from Minnesota to Edmonton at the 2006 deadline might be one of the closest matches (Roloson, then 36, was on the final year of a contract and a decent number-one) and netted the Wild first- and third-round picks. Obviously, Thomas’ age hurts his value in the long-term but he might be the best ‘available’ goaltender in recent memory. He ought to earn the Bruins’ a low-end first-round selection, a top-100 prospect or a second-line forward in a trade. Admittedly, that’s a high price to pay for a player who might be with a franchise for all of a single season – but Thomas is worth it and there’s no reason for Boston to deal him otherwise. But in the end, should they move Thomas? Sentimentality is a potentially dangerous thing in the salary-cap world. With Rask seemingly ready to take the reins and run with the role of number-one starter going forward; perhaps the B’s should get what they can, while they can. The Bruins ought to be contenders for years into the future and forward-thinking dispassionate reasoning on this issue could earn the Bruins some valuable assets for 2012-13 and beyond. However, even with several pressing needs for Boston during the summer of 2012, the B’s should pass on moving their folk-hero ‘tender. Despite some well-publicized issues, his performance for the Black and Gold over the past decade should earn him a reprieve and the right to retire as a Boston Bruin if he so chooses. 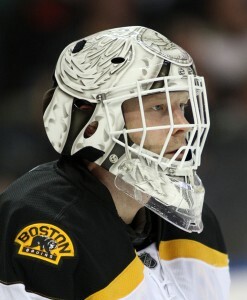 Even if the B’s could secure a ‘decent’ return for the American netminder, would that return offset the loss? Could it even come close? The Bruins benefit more from hanging onto Thomas and keeping the player who led to the team’s renaissance around for one more season. Who knows? He could prove the doubters wrong again.